Hello my name is Charlie and my bike's name is Ruby. But I might have to change that this winter after she gets some new paint. (Pearl white with pink metal flake) I have changed her a little. 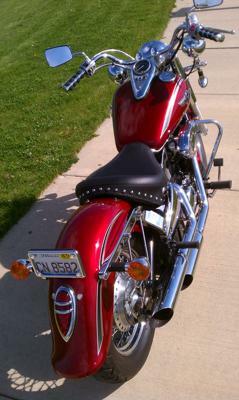 I took off the windshield, bags king queen seats. And added some *BLING* new grips new mustang solo seat, Chrome. I wanted a little pink scooter, But ended up with a bike. (long story) Hubby has a Yamaha Warrior 1700. I just gotten my motorcycle licence, so I'm a newbie. And hoping some of this new rider jitters wares off a little. I'm happy to have found a form with all women. I love some of the post like Helmet Hair I would never find this in the forms with all men they just don't care. Anyways Happy Safe ridding to you all. 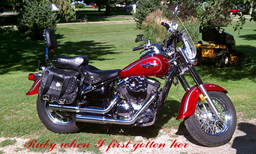 I have a 2007 Kawasaki Vulcan 500...and I am a new rider. Rode bikes when I was growing up...but dirt bikes and street bikes are a little different. 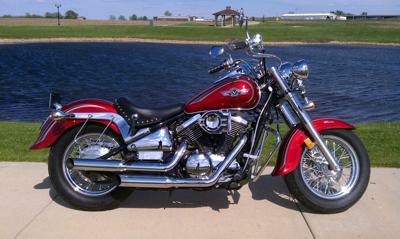 I love my Vulcan 500. Good luck to you and post a new pic once you get the paint job done.